The heart of the Sheraton Denarau Villas is a large, lagoon-style pool surrounded by tall palms and shady lounge chairs. Guests also enjoy privileges at the two adjoining hotels, which feature a full-service spa, golf and racquet club, and 17 restaurants. When it’s time to retire, traditional guestrooms and villa-style suites with kitchenettes offer multiple options for couples, families, and groups of friends. Part of the Denarau Island resort complex, this property is 200 meters from the beach and 500 meters from the golf and racquet club. Guests also enjoy full access to 17 restaurants, several swimming pools, and the other amenities at two adjoining resorts. 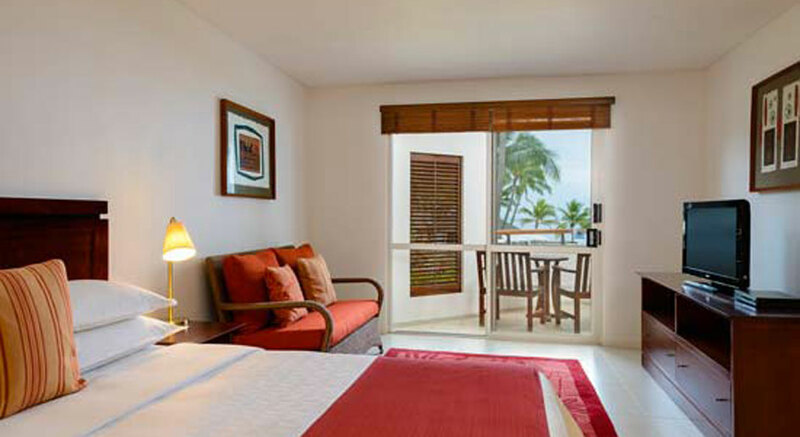 Contemporary and modern, Sheraton Fiji Resort guest rooms are warm and welcoming, providing guests with many of the comforts of home. Designed with comfort in mind, the refreshingly spacious guestrooms and suites are beautifully furnished in harmony with idyllic South Pacific setting. Each room features the finest amenities inluding the cushiony soft, Sheraton Sweet Sleeper Bed, 32” flat screen TV, high speed connectivity, work desk and innovative mood lighting to ensure a truly relaxing experience. As guests at Fiji’s only five-star integrated resort complex, Sheraton Fiji Resort guests are able to access all the facilities at the adjacent Sheraton Denarau Villas and The Westin Denarau Island Resort & Spa. Relax and soak up the sun by any of the six swimming pools. Indulge at a tempting selection of restaurants and bars. Enjoy a variety of other water sports or rejuvenate with a pampering treatment at the awarding-winning Heavenly Spa by Westin and many many more to dos! Peacefully nestled amidst 1,350 square metres of lush meditation garden only 100 metres from our resort, the spa’s tranquil surroundings set the scene for spiritual healing and sensory pleasure at the highest level. This award-winning Spa located at the adjacent Westin Denarau Island Resort & Spa is beautifully designed to blend with nature. As the most sophisticated spa in Fiji, this carefully constructed facility features a beautiful authentic design, a lush and peaceful environment, luxurious spa amenities and renewing body treatments. The spa’s 10 beautifully appointed open-air therapy rooms and two suites are designed as traditional Fijian bures, blissfully serene structures made of wood, thatches and river stones. Each of the spa’s treatment bures features beautiful landscaping and a private treatment room with hydraulic treatment bed and open-air shower, while the spa suite has all the luxury and privacy of a private changing room, air-conditioned lounge, outdoor shower and outdoor bath, ideal for couples. State-of-the-art, modern spa facilities are also introduced in the Heavenly Spa, including a high-tech steam room, Jacuzzi, Vichy shower, custom-made hydrotherapy tub and jet showers. Children of any age are permitted at the resort at any time of the year. Younger guests are invited to experience all the fun and games of the renowned Lai Lai Kids Club. Offering a comprehensive daily program, the Lai Lai Kids Club keeps children entertained throughout their stay with activities ranging from Fijian Language Lessons to Fish Feeding and Face Painting, to name just a few.